Add instant style to your bedroom with beautiful bed quilts! From twin bed quilts to king size, these quilt patterns feature a variety of techniques perfect for any decor. Honor daybreak with a cheerful quilt made from two favorite blocks in punchy orange and playful teal. Use an array of light and dark florals to construct the sweet and subtle double-bed-size quilt. Set on point, color blocks stand out among the sashing strips that create stars where they intersect. Whether you love retro or have fond memories of sleeping under a 1930s quilt, you’ll adore this cheerful row quilt. Strip-piecing makes assembly easy! Give your bedroom an island vibe with a tropical print, twin-size quilt that’s easy to piece. Lighten up a guest room with a 1930s bed quilt edged with random reproduction pastel prints. If you’ve got a stash of fabric scraps, this is the perfect project for you to put them to good use. Time-saving strip piecing makes it easy to complete a Four-Patch quilt. Bright pink florals melt together with cocoa brown in this cheerful star-block bed quilt. Choose an allover dark print for the border and assorted fall tones for the strips to make a bed quilt with an autumn feel. Make a quick-to-assemble patriotic picnic throw or cozy cottage twin-size bed quilt from your favorite scrappy assortment of red, white, and blue prints. Stitch up Nine-Patch blocks and combine them with setting squares for an easy checkerboard-style quilt. Treat yourself to a room makeover complete with a coverlet pieced in flirty florals and dainty checks and edged with pretty prairie points. When temperatures drop, curl up in a bed-size flannel quilt with pops of green that hint at spring. Stitch a queen-size bed quilt using a pretty paisley print. Foundation-pieced sashing frames a center of Pinwheel blocks. Create an exquisite bed quilt and matching ensemble of pillows using crisp, cool colors. Set Square-in-a-Square blocks on point and surround them with a striking blue toile to create a timeless, treasured bed quilt. Look closely: There really aren’t Churn Dash blocks in this quilt. It’s the intersections of the asymmetrical block that create the appearance of Church Dash. Use delicious sherbet-tone batiks to make an easy bed quilt. Start with a simple square, surround it with four mix-and-match rectangles, and voilà—one block is done. Sew Pinwheel blocks using a variety of bright florals and prints. Use leftover fabric to create a bedroom ensemble that includes pillow shams, a bed skirt, and a valance. Cranberry reds, sage greens, and rose-petal pinks combine with a range of neutrals to create an appealing pattern in an easy-to-piece bed quilt. This oh-sew-easy bed quilt makes creating curves a breeze when you learn the trick—fusible appliqué. Bright solid-color squares pop off the gray background in this simple-to-sew grid quilt. Use 15 assorted fat quarters to make the twin-size bed quilt. 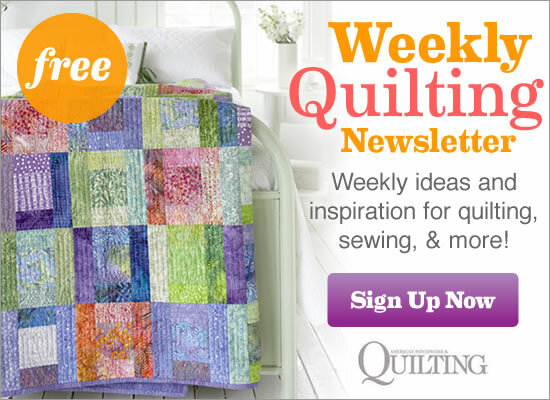 Select an assortment of fall-theme fabrics and sew a cozy bed quilt. Strip-piece a cozy bed-size quilt quickly. Sew a coordinating bed skirt and pillow to make a bedroom ensemble. Don’t let cold temperatures stop you from sewing up a storm. Keep warm by combining flannels from your favorite collections to create a cozy bed quilt. Fussy-cut printed fabric panels to make a fast and easy twin-bed quilt. Use a combination of prints—florals, rickrack, dots, and tone-on-tones—to add an extra splash of style. Turn a pieced quilt top into a summer-weight quilt by finishing it as a duvet cover instead of layering it with batting. Make a big quilt to show off eye-catching prints, solids, and ticking stripes. This easy bed-size quilt features two sizes of triangle-squares, large Four-Patch units, and a variety of rectangles. Made solely of squares, this hourglass block quilt makes great use of coordinated prints. The diagonal seams and darker fabrics in each block create graphic angles across the quilt top. Assemble a bed quilt that is sure to brighten any room. Use fusible web to appliqué custom-made initials in the center block.